400 Women is a conceptual installation project by artist Tamsyn Challenger utilising a mass collaboration with nearly 200 artists in response to the murders of women in Ciudad Juárez, Mexico. 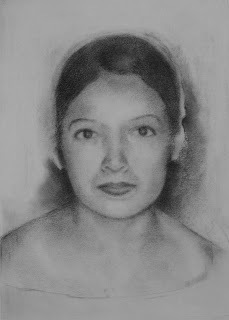 I was one of the artist's selected for this project and created a portrait of Violeta Mabel. 400 Women was first shown in London at the Shoreditch Town Hall basement recieving acclaimed reviews and was on Newsnight Review. This year as part of Edinburgh's Art Festival, 400 Women is shown in Canongate Venture, a former school. I feel very honoured to be part of this show.